We kick off this issue with some fantastic news, as earlier this week the one and only Woody posted a drum solo to show that he’s back behind the kit and playing with the trusty sticks again. “Well, as predicted I paid for it the next day with my back, but it was worth it. Anyway, I know now that nothing can hold me back, and it’s only pain. I’m still getting stronger every day, and in the weeks to come drumming will have less impact on my back. All at the MIS wish Woody all the best, and hope that he continues to recover as well as he’s done so far. Just try not to rush things! “Woody, you always were one of the most determined people that I have ever known….whether for good or evil….hahaha. This is now the soundtrack whenever I don’t feel like lifting weights or going on the bike or practicing guitar or doing vocals. You are an inspiration in an entirely different way, yet again. Pace yourself. You’re like me. Before we get this issue underway, we must thank subscriber Darren Gilbert who spotted that although we’d been promoting Lee Thomposon’s “One Man’s Madness” project, we’d accidentally deleted the link to the web site for the past couple of issues. An advanced test screening version of the new Mockumentary comedy and life story film, hosted by Lee with A Q&A after the film and a special performance. 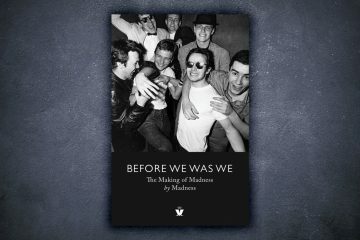 Lee Thompson’s comedy life story film, featuring multiple mad Lee performances, and starring all of Madness and many more well known voices, is nearly complete and coming out this year. All that remains to make this possible if for your to pledge and help complete the project as planned. Over on the Mad Chat Facebook Group, member Jim Ryant reported yesterday Morrison’s are currently clearing out their presentation tins of Gladness Craft Lager, complete with pint tankard. If you’re lucky enough to find this in your local Morrison’s it should be priced at a mere £6! Also at Morrison’s, Andy Stav Davarias, of the Madness Facebook Group, reports that Absolutely London Pale Ale is back in stock. It’s rather nice, and well worth checking out. Adding 3 b-sides, the obscure “Same again” to two covers, “I feel good” (James Brown) and “Alright” by Supergrass, to no doubt try and encourage the casual music fan to buy this budget priced release. This new CD is out now and has started shipping to fans. The sleeve features a new cover design, based on a photo taken recently for Suggs Live show. Fans have reported that “The Tune” is the instrumental version from the Cecillia CD Single, rather than the vocal album mix. Can’t Touch Us Now – Limited Double Vinyl Edition. All 16 tracks. A new half speed master in gatefold. The inner sleeves inside the gatefold outer cover features “Hong Kong” and “Australian” versions of the albums cover art, no doubt used in some function on the recent tour. So, we’re treated to Hong Kong’s Tian Tan Buddha statue and Sydney Opera House replacing St. Paul’s, for example. There are also a number of other country references mixed in. We noticed Dame Edna! on the front of the Australian one. Nick Godwin, the writer of the original songs sung by The Silencerz, returns to the bits and bytes of the MIS with a brand new track. Daley and the boys bash out a cracking set of tunes from Ska, to Madness, to LTSO known numbers. They also play Ian Dury, The Beatles, Alex Harvey, Paul Simon and many, many, more great covers. A full set from The Skapones, and DJ Swanny for the MIS will be there too! Your £10 entry will be going to Specialized for Teenage Cancer. See you there! Now, over to Nick about the 5th Silencerz’s original tune…. Here are lyrics for the latest song now in the Silencerz set. A real Horses Head, laid inside my bed. Song for you, that was included too. That’s it. Make of it what you will. The big news this week was that “it” was confirmed! What? 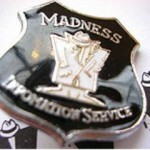 That Madness would be involved in the closing ceremony of the London 2012 Olympics, that’s what! We first ran rumours of Olympics Involvement months back, having heard from a dancer involved in the selection process for the olympics ceremony, telling us “Our House” was one song they were performing routines to. The Sun newspaper ran a closing ceremony rumour story based on pub eavesdropping later that month. At the time we were aware the band were “in talks”. More solid conformation came when we heard from band sources that earlier in August they would take part in a photo shoot for this event, presumably using a lot of the acts involved. 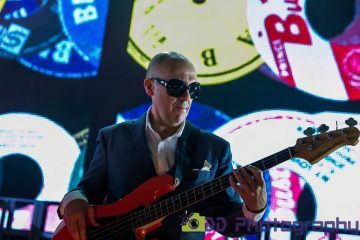 It was believed Bedders would again be present for this event, and that the band were to be sandwiched between a Notting Hill Carnival section and the Cold Stream guards, early in the running order. It was planned to be a ceremony reflecting varied British culture, that would see Ray Davies’ Waterloo Sunset, and Eric Idle’s Always Look on The Bright Side Of Life performed also. We brought this issue to a close with some non Madness related news in the form of heads-ups for The Beat and Neville Staple gigs. We started off this issue apologising for some double posting related antics of the previous issue. We sent it out on it’s usual Sunday evening time slot, but for one reason or another it failed to go out to subscribers. Sending it out again then resulted in TWO copies landing in subscriber mailboxes. The mystery of computers! 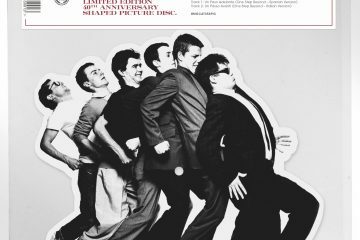 This issue featured an interview with Suggs from a Norfolk paper, leading up to the Blickling Hall gig. 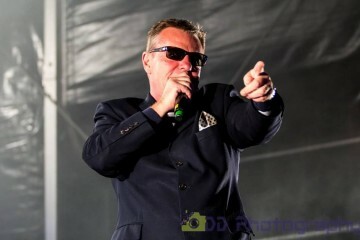 The journalist claimed Suggs had said that Madness would play a 10 minute song at Blickling Hall. If his turned out to be a true quote, and the band did decide to go ahead with this, then we could be looking forward to the possibility of the track “The Liberty of Norton Folgate” being aired live. Naturally, we promised you more on this if it actually happened. 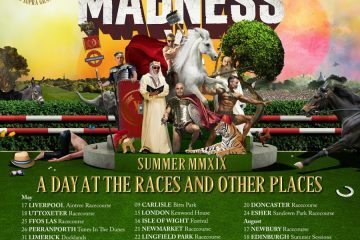 We reported on Madness’ forthcoming appearance at Guildfest, and in a recent newspaper report Chas was quoted as saying that a number of new songs would be added to the set. These would be Bingo, Let’s Go and NW5. All three tracks, we were told, were possibilities for inclusion on the new album. It was merchandise news next, at Chris and Emma reported that those people attending the forthcoming Madness weekend could look forward to not only a well stocked merchandise stand, but one that was offering goods at prices cheaper than originally sold. Not only that, but half the profits would go towards the Arlington House charity. Moving on, and it was here where we took a first look at the lyrics for the new Madness track “Let’s Go” and “Bingo”. Not only that, but we did our very best to try and analyse each verse and explain either why the lyrics had been used or what they meant. Not an easy task! Suggs was asked if he’d bought anything off Ebay, the age of his kids, if he’d kept a diary (and was it honest), and much more besides. We brought this issue to a close with the news that the Nutty Forum, run by Adam Nichols, had received a revamp and was back up and running. Potential visitors were told that many errors had been fixed and that the forum security had been stepped-up, which is always good to know. This issue got off the starting blocks with us rambling about just how busy the Total Madness Mailing List was at the moment. What was so unusual about this? Well, we were in the traditionally quiet summer months, and to see so much chatter was unusual. We began the articles in this issue with the sad news that the Essential Festival had been cancelled. In the previous issue subscriber Colin Hinchley had rightly commented that whilst it wouldn’t have been a replacement for a Madstock, it would be playing host to a selection of great bands. After some research we discovered that a combination of the venue suffering considerable damage due to terrible weather conditions over the previous weekend, and losses faced by the company following the disastrous Bristol Essential Festival, it was decided that the event would have to be cancelled. Next, it was over to Colin Galbraith, who wrote a lengthy, detailed and very well written article about the forthcoming Madness ‘Our House’ musical. 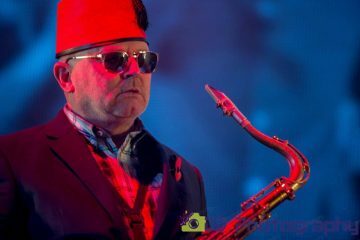 Some fans felt the article was a dig at Madness, and so Colin responded, explaining why he wrote it, and detailed just how much he loved the band. He also stated that he would be visiting the show and attending one or two of the gigs at the forthcoming Christmas tour. 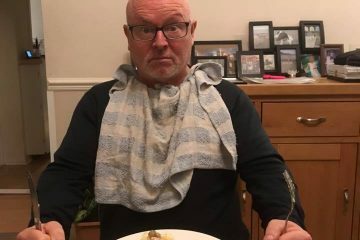 It was over to Iain Mason next, who, through his contacts at The News of The World, was able to provide a few more details surrounding the band’s recent top-secret gig in Spain. It transpired that the band were part of a £500,000 wedding party in Puerto Banus, Marbella. The nuptials were for a millionaire internet whizzkid called Chris Gorman, 35, and his 34-year-old wife Mary, who were renewing their vows and celebrating their 10th anniversary. 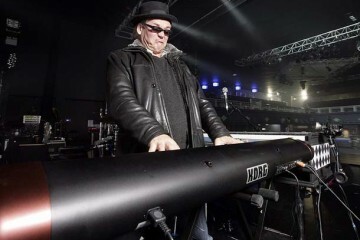 We brought this issue to it’s inevitable conclusion with the news that Chrissy Boy and Bedders had recently played at the Meltdown Festival alongside the legendary Terry Edwards. 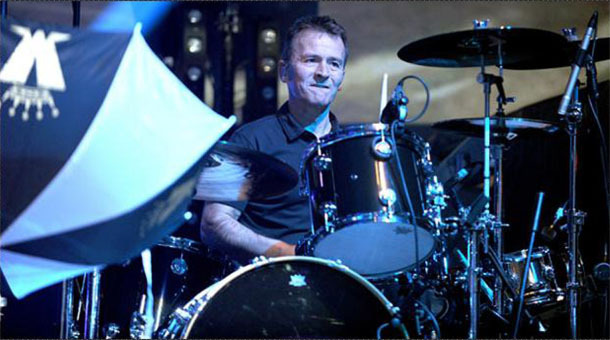 Terry also had some new of his own, and told us that the new Terry Edwards and the Scapegoats CD has Woody drumming on eight of the tracks, and has remastered studio recordings featuring Bedders and Chrissy Boy. The CD, we were promised, would be out at the end of the month. This week, tickets went on sale for Voice of the Beehive’s warm up gig, before their reunion appearance at Indie Daze festival… and promptly sold out. Four times in fact! The Lexington, being a small Islington venue, holding just 200 places, saw the Thursday pre sale snapped up in a whopping 21 minutes. As that timing takes it’s figure from the last completed basket transaction we’re certain that it was sold out much quicker than that! A similar thing happened to the general sale from two vendors; Star Green and WeGotTickets, the next morning, and later in the evening a handful of return or additional places completely sold in just over an hour. We think that all 200 are now gone, showing that this much-missed band still has a following that haven’t seen them play for years. Thankfully, the Kentish Town Forum holds two thousand or more, so grab yourself a ticket for that if you can. At that gig you’ll also be able to catch other acts such as Salad, House of Love, Crazyhead and some of the Wonder stuff. If you’re coming along to the 100 Club “Thommo gig” this coming Saturday, as well as Swanny DJ’ing for us, we also have a donation of two tickets to House of Common for Specialized, too! 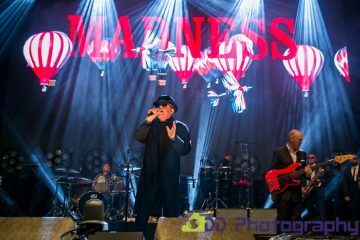 Look out for the raffle and you could win entry to Madness’ only 2017 London gig, currently worth over £90!